I first learnt about this band through the Singapore Dark Alternative Movement (S.D.A.M.) events. Keyboardist, Benjamin Ang often performs as a DJ at those events. 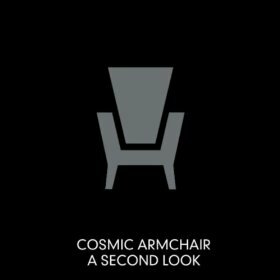 Together with vocalist, Jane Lau, the Electronic/SynthPop duo, Cosmic Armchair releases their second EP, "A Second Look". Upon seeing their performance at Baybeats this year, I'm starting to like what the band is trying to show us. First track "Don't Leave Me Here", gives a brand new revival to New Wave. It's the kind of song with an 80s influence with less cheesiness in synthesizers. "Conversations" is a direction most local musicians will never represent themselves. There's a recording of a girl speaking in a Singaporean accent repeating in the background. I think it's a brilliant idea. It's better to promote yourself as an Asian than to imitate other culture that you're not, especially for Singapore artists. I really like how the album is so soothing to the ears with cleverly composed keyboards and vocal parts which can be heard in "Just One Look" and "Take You Home". "Grey (Second Look Remix)" which was previously featured on their debut EP, "A Different View". Compared to the original version which sounded more like FuturePop to me, this one has more of an Electronic feel to it. The band has justified that they're a serious Electropop band with the quality recording of "A Second Look" and also as an impressive live act. Overall, I think I have spent my money well on getting this EP. My first impressions on them weren't so good but they certainly have progressed from their earlier performances and the debut EP. They certainly deserve more support for their future efforts.